Outline: Intro describes heaven and the need of heart cleansing in order to enter. Christ's atonement. Story of the wedding garment told in "village terms." Invitation. All you men, women, and children, listen. I have a message for you from God. He has sent a special invitation to you. (calling, blessing) It is a wonderful invitation and you will want to accept it. God says He has prepared a beautiful place for you to live in. He wants you to come there, and leave all the dirt and trouble and sickness and fear of your own village. This place is where God Himself lives. There is no sickness, no hunger, no fear, no trouble there. There is no darkness and no death there. It is a place of happiness. Everything is beautiful. But we cannot bring anything into this good place that will spoil it. If the chief invites you to a great feast, you wash yourself and put on your best clothes. If you come all dirty the chief would not be pleased. It is the same with God. He will not let you come to His good place with a dirty heart. He will not let you come just as you are. The evil you have done has made your heart dirty. Your heart must be clean and you must obey God's Words if you go to His place. You are not able to do this yourself. Jesus is the only One Who has the power to do this for you. God sent Jesus, His only Son, into this world to die, so He could make you clean. He took the punishment for your sins, and because of this He is able to wash the sins from your hearts. God says our sins are like refuse. He also says that even our good deeds are like filthy rags, because they came from our sinful hearts. When Jesus cleanses our hearts, we are able to do that which is good in the sight of God. It is like putting on clean clothes. If we have clean hearts we will be able to enter God's beautiful place. God's message tells us this story. There was a great king (chief). 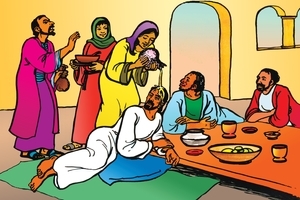 He prepared a wonderful feast and invited many people to come. He did not want His beautiful feast to be spoiled by their clothes from the village, so He prepared fine clothes for them to put on when they arrived. After they had put them on, they could go to the feast. When the king came into the feast, he looked around and saw one man who was not wearing one of the King's garments. He was in his own clothes from the village. They were the best that he had, but among the king's clothes they looked very bad. The king was angry. He told His servants to tie him and take him out to be killed. My friends, Jesus told us this story to show us that we are not good enough to come to His place. But if we will let Him, He will wash our hearts and make us good. When (this way, if so, thus) we can go to God's good place when we die. But if we do not receive the washing (cleansing) that Jesus has the power to give us, we will be like the man in his own clothes. We will not be able to enter heaven. We will go to hell instead. God's invitation is a very good one. Do not refuse it. Do not wait to accept it. You do not know when you will die. Receive God's clean clothes now. Believe on Jesus, God's Son now. Turn from your sins. Jesus will cleanse you and make you ready to go to God's place (house). GRN has recorded a version of this script in 230 languages and dialects. See full list.